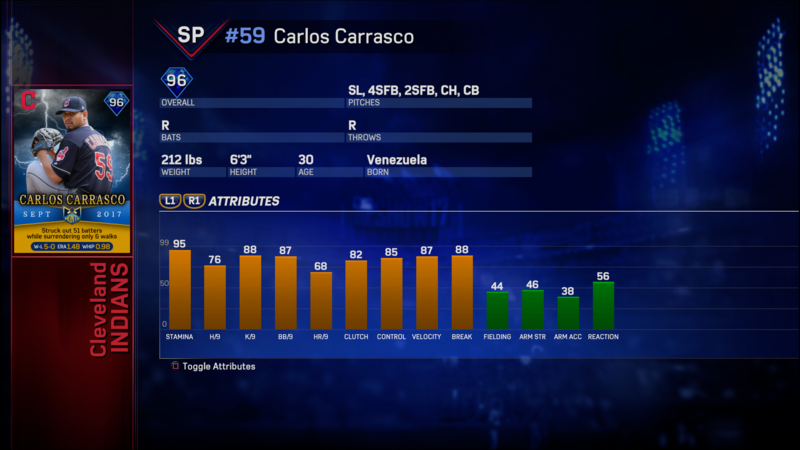 Carlos Carrasco (Diamond, 96 OVR SP) headlines the seven new Flashbacks making their Diamond Dynasty debut in the September Monthly Awards series. He was among the league leaders in ERA, WHIP, Wins and Strikeouts in September, while helping the Indians secure a spot in the Postseason. Carrasco can only be acquired by completing his Player Epic Mission chain. 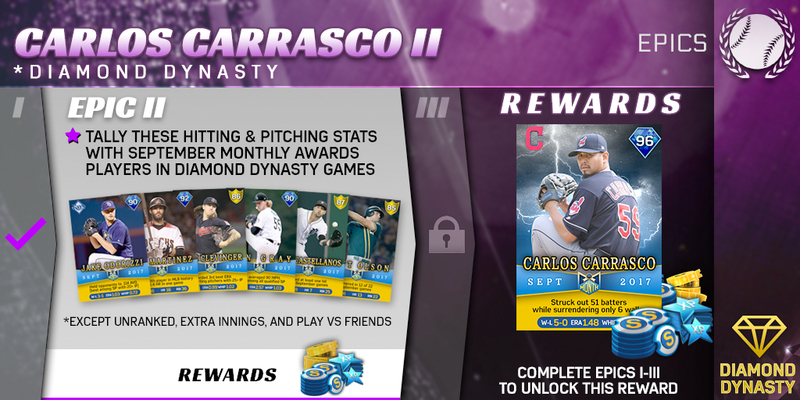 Carlos Carrasco III - Collect all six Monthly Awards players to unlock Carlos Carrasco’s Flashback player item. There are a limited number of Bases Loaded packs available (20,000), which means it can sell out in the Show Shop, and it is limited to two packs per person. Each Bases Loaded pack guarantees one of the five Monthly Awards Flashbacks listed above along with 3 other player cards. The cost of the Bases Loaded pack is 15,000 Stubs and the player items can be sold on the Community Market. The sixth and final September Monthly Awards Flashback needed in the Collection appears in the Ticket Counter. Monthly Awards Flashback Jake Odorizzi (Diamond, 90 OVR SP) will be in the Gold XP Level Zero slot and costs 1,800 Tickets. In the final regular season Roster Update, there’s a new Diamond starting pitcher along with 30 upgrades or downgrades. Watch the video to see the biggest movers and discuss the changes on the community forums. More highlights can be found in the Roster Update page here. If you want to relive the success of the Diamondbacks and Yankees in the Wild Card games, then look for two new Missions in the Events category. In the Diamondbacks Wild Card Recap Mission (pictured above), you have to hit four triples with Arizona players while playing in the Division Series Event. That’s the only place the triples will count, but you don’t have to hit all four triples in one game. You can take as many games as needed to earn one Postseason Pack that guarantees a Gold or Diamond Postseason player item. In the Yankees Wild Card Recap Mission, pitch 8 innings, record a hold and a win with relief or closing pitchers – just like the Yankees did in their stellar Wild Card win. Again, you don’t have to complete this Mission in one game, but you can try! Legends, Flashbacks and Live Series player items can be used to complete either Mission during the Division Series Event, which lasts until next Friday, Oct. 13. Here’s a sneak peak of the new Ranked Season Warehouse that starts next Tuesday, Oct. 10. The current Season Clubhouse ends on Monday at 11:59 p.m. PT, and rewards will be distributed on Tuesday before Season Warehouse begins. Q: Will there be another Roster Update that takes Postseason performances into consideration? A: Yes, we are targeting mid-November to release the last Roster Update of the year after the World Series wraps up, and we will be looking for player attributes to upgrade or downgrade. Q: Where can I find my rewards for the Wild Card Missions where I picked the Yankees and Diamondbacks to win? A: Look for a redeemable Mission in the Time Limited category. The redeemable Missions do not expire. Q: What else is new in The Show 17? A: So much! Right now, the Division Series Event is live, the Championship and World Series Events are coming up, and Challenge of the Week is mirroring Postseason hitting and pitching match ups. 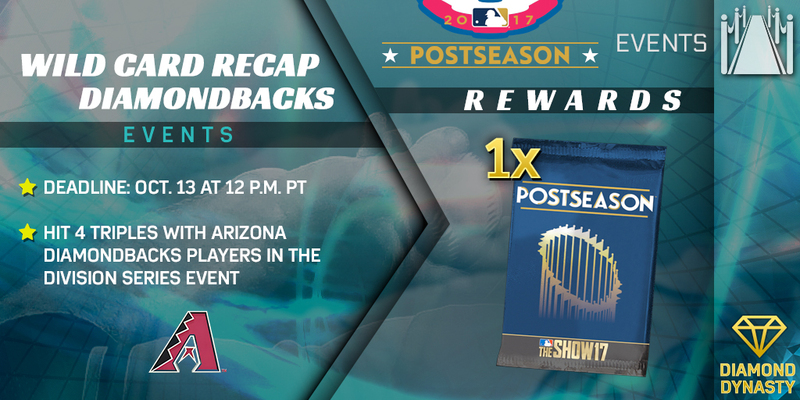 In the Diamond Dynasty Events, you can win a lot of great Legends, Flashbacks and Pack rewards, and don’t forget about the Postseason Epic! It requires you to win 100 Events games by Nov. 13 while collecting those Event player rewards to earn the 99 OVR Postseason Flashback Justin Verlander. Rewards for Ranked Season Clubhouse will be distributed Tuesday, and the next Ranked Season will begin later that day. Also, look for more Missions to choose the winners of the ALCS, NLCS and World Series. 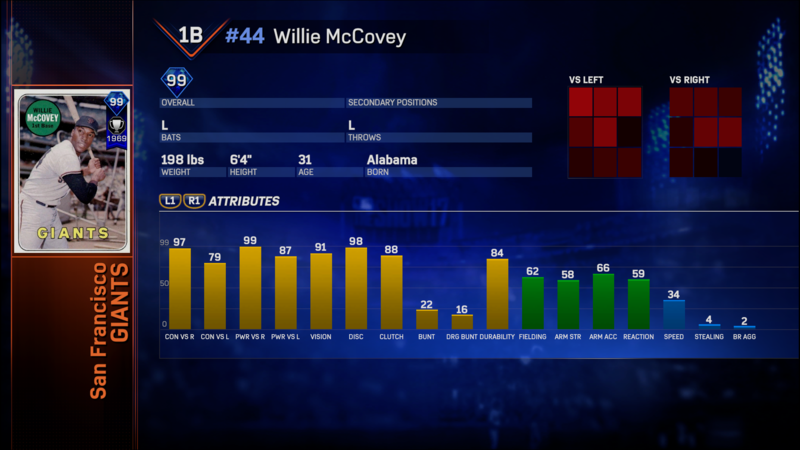 Q: Will there be more Programs in Diamond Dynasty? A: Yes. The Reggie Jackson and Adam Wainwright Postseason Programs are out now, and the Hardware Programs are on deck. Hardware Programs are scheduled to be released in November.